I was a Guider long before we decided to have children. So when I learned I was pregnant, right before heading off to spring camp, I had no doubt that I would continue Guiding after my daughter was born. Luckily I had some great role models in my sister Guiders on how to keep on Guiding with a baby on board. So I bought a bigger uniform shirt to accommodate my growing belly and continued with our weekly meetings right up to my due date. After Claire was born I toted her to meetings in the baby carrier along with my Guide bag. She wore little onesies that said “Future Girl Guide” and observing her was part of the requirements for the Childcare badge for our girls. I first suspected that I was pregnant with my son at Pathfinder camp last year. I was exhausted and breathless on hikes. Plus I had to hold my breath in the latrines as they were so much more fragrant that usual. Or so it seemed to me. By the time we took the Guides to camp two weeks later I had confirmed that I was going to be Guiding with a baby on board again. So how do you keep on Guiding with a little one in tow? The girls and my sister Guiders make it easy. Guide age girls love babies and are super helpful (especially those that complete the Red Cross babysitting course). They also can fetch the things we need from the cupboard, pick up things from the floor (bending over with a baby in the carrier is impossible) and follow verbal directions easily. The girls were very patient and understanding when our meetings would get interrupted by Carter’s cries, or when I would have to sit some things out to look after him. My sister Guiders took turns holding him to free me up to do something active with the girls and to give me a much-needed break. Carter came along on community walks and field trips, including trips to Pizza Pizza University and to The Body Shop. He is now an expert pizza maker and knows all about skin care and age appropriate make-up! The biggest challenge to date was taking him to Guide camp this spring. As I did not attempt to take Claire to camp when she was a baby, I was nervous. However, I decided to give it a try anyway. I used to think that we packed a lot of camp gear, but that was nothing compared to the gear needed for Carter at camp. In addition to his own bag and Thermarest, we packed a playpen, stroller, bug net, solar net and rain cover, baby carrier and A LOT of diapers. The girls were excited to have Carter come along and he was a real trooper. He happily played in his playpen while we pitched tents and set up camp; he fell asleep in the stroller on our night-hike, and he loved sleeping in the tent with me. During down time the girls took turns holding him so I could help with crafts or get things ready for the next activity. My sister Guiders would pick him up when he was fussy, freeing me up to do things with the girls. So I guess that the answer is that Guiding with a baby on board is accomplished with a lot of help, understanding, patience and sense of humour. Things may not always happen in the time frame you plan, or in the exact way that you would normally do them, but everything gets accomplished in the end and everyone has fun along the way. Which, when I come to think of it, is a good recipe for Guiding even when you aren’t toting a future Guide or Scout along for the ride. By guest blogger Karen Cross: “I have been a Guider since 2004 with the 146 Toronto Guides and I am now also a Community Guider in Community 18 in Ontario. I was a member of the 13th Chateauguay Guide Company when I was a girl.” Read previous posts by Karen on our blog: Rock the Mall. Members, volunteers and parents: We’re always interested in hearing from you! Will you be one of our guest bloggers? Email marketing1 (@) girlguides.ca for details. 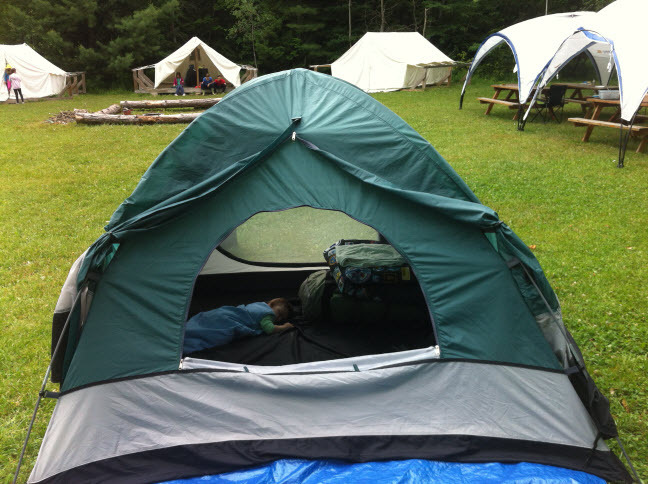 This entry was posted in Girls' Guides and tagged baby, camping, female role models. Bookmark the permalink. I am so glad you posted this blog. I have a 10 month old and I have camp in a few weeks. Not sure if we’ll take him along as it’s a multiple Pathfinder camp at Camp Wyoka but this might be a good way to bring it up with them. I also took my baby to camp this year, however she is not as easy going as your little guy. She had plenty of experience with the Brownies as she has gone to almost every meeting with me since she was born. This was great for the girls as she simply became a part of our group and they were understanding about my new limitations while babywearing. When we finally went to camp, she was only 3 months old and refused attention from anyone else. She spent the majority of time in her snuggly wrap, we also had to have downtime. I was glad my sister guiders could cover me on program when I needed to be with her. Everyone was very accomedating, and as they were all moms also they could understand what she needed from me. We were fourtunate that our site has both a house and tenting area. So myself and the baby could sleep inside and avoid disturbing anyone else with our frequent night feedings. Overall I would definitely take a baby to camp again, but I would hope that they might be a little older and independant when the time comes. Thank you so much for posting this! I found out I was pregnant half way through the Guiding year last year, and my Brownies were so excited to watch my pregnant belly grow. Our daughter was born at the beginning of August, and I can’t wait to start taking her to Brownies with me. Your post reassures me that – contrary to what lots of people think! – I am NOT crazy to stick with Guiding with baby in tow. Thank you! at his sister’s advancement, he was SO MAD at Daddy!! How come he had to sit in the audience! those were his girls up there, he beonged with them! !